The 416 Fire rages down the east slope west of U.S. Highway 550 at Shalona Hill on Friday afternoon. Wildfire perimeter is shown in blue. 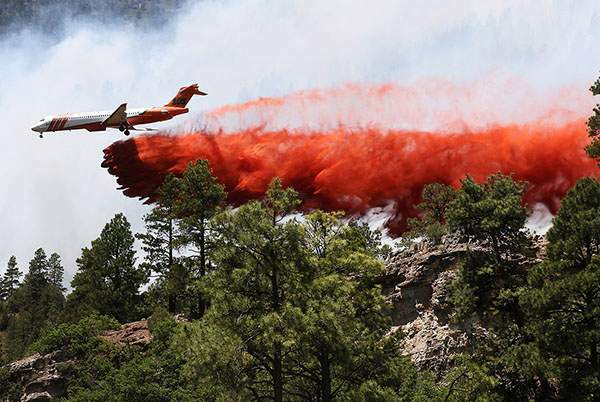 A forest Service tanker plane drops retardant on the 416 Fire on Friday north of Durango west of U.S. Highway 550 at Shalona Hill. Here is the latest news on the 416 Fire north of Durango. This is a developing story and will be updated as more information is released. The 416 Fire has grown to 1,100 acres as of 7:30 p.m. According to La Plata County, the fire behavior is calming. Evacuations are in effect for about 825 residences; another 750 are under pre-evacuation notice. La Plata County Manager Joanne Spina has proclaimed a state of local disaster in unincorporated areas of the county. Spina has recommended to La Plata County commissioners that the state of local disaster continue for more than seven days. A second evacuation site has been opened for people who have had to flee the fire. The evacuation center is at Silverton School, 1160 Snowden St.
A pre-evacuation notice has been issued for north Electra Lake to Meadow View Drive, including Purgatory and Durango Mountain Resort, and Cascade Village. The subdivisions of Red Tail Mountain Ranch, Celadon and Elkhorn Mountain are also under pre-evacuation orders. Mandatory evacuations are in place for the Electra Lake area. Residents must travel north and check in at the Silverton Visitor Center to receive credentials. Evacuated residents in Durango must check in at Escalante Middle School, 141 Baker Lane. U.S. Highway 550 will remain closed overnight. The closure will be re-evaluated on Saturday, said CDOT spokeswoman Lisa Schwantes. Purgatory will be closed for activities Saturday. San Juan Basin Public Health has advised that smoke in the air is particularly dangerous for the very young, elderly or people with heart and lung conditions. Stay inside and reduce outside physical exertion. Mandatory evacuations have been expanded to Electra Lake Road. Evacuees must travel north on U.S. Highway 550. This includes Chris Park and Haviland Lake. Evacuations are required for residents between Bakers Bridge and Electra Lake road. Winds and dry fuel have caused the fire to burn 863 acres, said Scot Davis, spokesman for the Forest Service. The main objective is to keep the fire on the west side of Highway 550, he said. Evacuations centers have been opened at Escalante Middle School. Northbound evacuees should check in at Silverton Visitor Center. 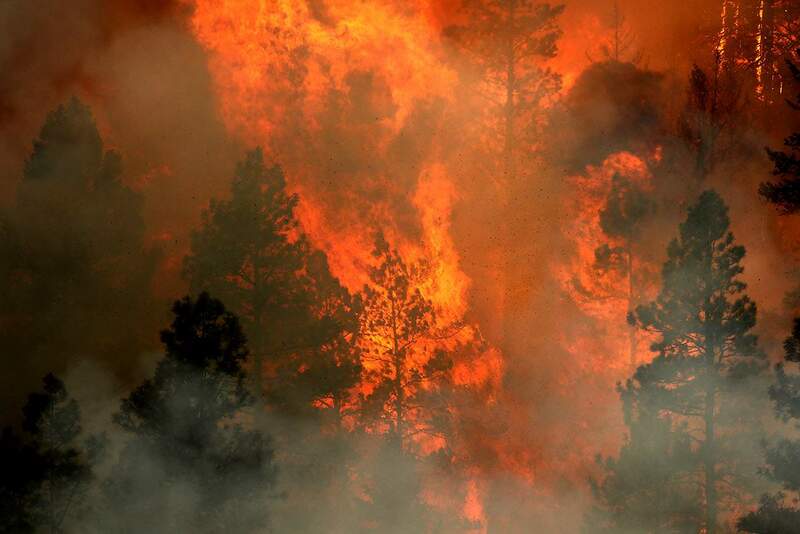 According to La Plata County, all evacuees needs to check in to one of those two places to receive credentials as a resident in the fire area. 4:25 p.m.Livestock can be evacuated to the La Plata County Fairgrounds, 2500 Main Ave., in Durango. Call (970) 385-8700 to coordinate pick-up of livestock. Small animals can be evacuated to La Plata County Humane Society, 1111 South Camino del Rio, in Durango. Donate clothing and household items to Discover Goodwill of Durango, 1230 Escalante Drive. Financial donations can be made to the Community Emergency Relief Fund by calling (970) 375-5807. 4:15 p.m.Firefighters are trying to keep the 416 Fire from crossing U.S. Highway 550 near Shalona Hill, where most homes are located. But keeping the fire contained to the west side of the highway has been difficult, said Butch Knowlton, director of La Plata County Emergency Management. It does not appear as if the fire had cross the highway as of 4:15 p.m., he said. If it had, aircraft would be hitting that side of the fire. But instead, all the aircraft were focused on the west side of the highway, he said. Knowlton reminded people not to fly drones anywhere near the wildfire. There was a report of someone flying a drone at the south end of the fire earlier Friday, and the La Plata County Sheriff’s Office was sent to try to contact the pilot, he said. 3:45 p.m.The Glacier Club and Tamarron subdivisions are under mandatory evacuation, said La Plata County spokeswoman Megan Graham. Residents should travel north on U.S. Highway 550. It was unknown if an evacuation center has been opened north of the Glacier Club. An evacuation center is open at Escalante Middle School, 141 Baker Lane, in Durango. At least 500 homes have been evacuated. U.S. Highway 550 north remains closed between mile markers 34 and 48, which is right about Honeyville to just south of Purgatory Resort. 3:30 p.m. The Durango & Silverton Narrow Gauge Railroad said it will cancel Saturday train operations as a result of the severe fire danger. “Due to the current conditions, due to the Stage 2 restrictions, we decided to cancel services tomorrow (Saturday),” said John Harper, general manager with the D&SNG. Early scanner reports and witness reports said the fire started near the train tracks, but no official cause has been released. 3 p.m. The 416 Fire was more than 200 acres in size. Residents who are under a mandatory evacuation are being escorted from their homes, said Scot Davis, speaking on behalf of the National Forest Service. At least one drone was flying in the wildfire area. Residents are warned not to fly drones near the fire, because it interferes with aircraft battling the blaze, Davis said. “We have got to get the drones out of the air,” he said. There are no reports of homes being damaged as of 2:45 p.m., he said. The fire was approaching U.S. Highway 550, but had not crossed the highway, he said. EvacuationsSeveral homes are being evacuated and many more are under a pre-evacuation notice as a result of a rapidly growing wildfire 10 miles north of Durango. 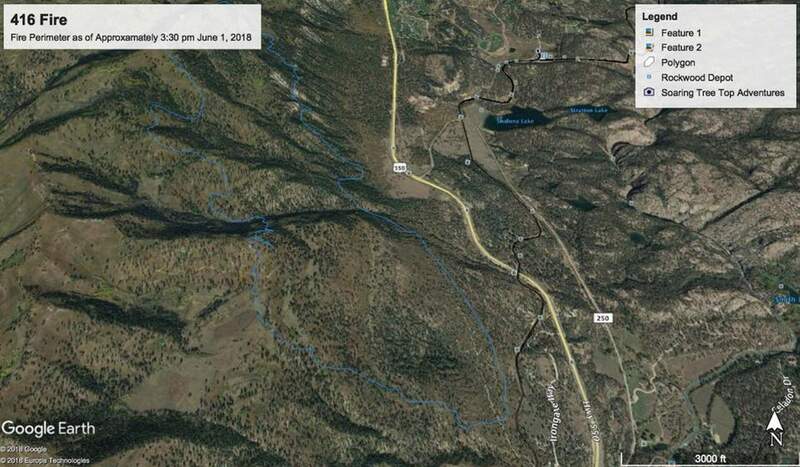 Homes from Bakers Bridge north to Rockwood, between the Animas River and U.S. Highway 550, were under mandatory evacuation as of 2 p.m., La Plata County government tweeted. Evacuees can go to La Plata County Fairgrounds to check in. The east side of Highway 550, from Rockwood to Electra Lake, is under a pre-evacuation order, La Plata County government said on Facebook. Anyone who is on pre-evacuation order needs to be ready to go, said Scot Davis, speaking on behalf of the National Forest Service. Ground crews are working to protect nine homes. Eight of the threatened homes are in the Iron Gate subdivision, which has been evacuated, Davis said. One home was in imminent danger, he said. La Plata County government set up a hotline for residents to receive information by calling 385-8700. Officials also warned people from flying drones in the area, which is illegal. The fire was reported about 9:50 a.m. Friday. It started in the Iron King area and moved west into the Mitchell Lakes area. As of 1 p.m. it was between 100 to 150 acres in size. The fire was about 100 yards from Highway 550 near County Road 250C, which is near Shalona Lake. Firefighters are trying to keep the fire from crossing U.S. Highway 550 to the east side. Air tankers laid down fire retardant to keep the fire contained to the west side of the road, he said. There are 15 aircraft on scene, including heavy air tankers and helicopters. He described it as “a hot fire being fueled by some pretty hot winds” that is moving fast. “I have a big fire cloud going over my head,” he said. U.S. Highway 550 was closed from Trimble Lane to Purgatory Resort. The fire was 100 acres in size as of 11:45 a.m. and was spotting up to a mile ahead of itself, said Megan Graham, spokeswoman for La Plata County. Durango Fire Protection District initially responded to the fire. A federal team is taking over command since the fire is located on national forest land. Multiple agencies are fighting the fire. There are 15 aircraft fighting the fire including four heavy tankers, two Type 2 helicopters, two Type 1 helicopters and two hot-shot crews, according to a news release from La Plata County. The column of smoke was so tall that firefighters were concerned it would collapse and cause spotting on the east side of Highway 550, where the majority of homes are located, according to scanner traffic. Emergency officials are asking drivers to stay off Highway 550, where drivers were stopping to observe the plume. The fire was burning 2 to 3 miles northwest of Hermosa, said Tom Eskew, who was working in the area. Weather forecastThe National Weather Service is calling for winds up to 25 mph Friday afternoon and a high of 78 degrees, said Jimmy Fowler, a meteorologist. A red flag warning, indicating critical fire conditions, is in effect for La Plata County until 10 p.m. Friday. Winds are expected to die down Friday night, and no red flag warning is expected Saturday. Red flag warnings are issued when wind, temperature and humidity conditions are at certain levels. “Tomorrow it will not be as windy, but it will be very hot and very dry,” Fowler said. Saturday’s high is expected to be in the mid-80s. The next chance of precipitation is on Sunday when the area could see scattered showers, he said. Animas Valley Elementary SchoolDurango School District 9-R will not be running buses north of Baker’s Bridge on Friday afternoon because of the road closure. Parents will need to pick up their Animas Valley Elementary School students at about 3 p.m. After school activities, including Kids Camp, are canceled, said district spokeswoman Julie Popp. Parents are encouraged to call the school at 247-0124 to inform staff of their plans. Staff will be available to supervise students until they are picked up, she said. “This is not a planned event, and so we will supervise them as long as necessary,” Popp said. Air-quality advisoryAn air-quality advisory has been issued by the Colorado Department of Public Health and Environment for areas near the 416 Fire. Smoke is expected to move east or northeast Friday afternoon. As winds calm overnight, the smoke is expected to drain southward along the Animas River. Heavy smoke is expected Saturday in Hermosa and Durango, the advisory states. Those with heart disease, respiratory illnesses, the very young, and the elderly should limit outdoor activity if smoke is present, the advisory states. Consider relocating temporarily if smoke is present indoors and becomes problematic. If visibility is less than 5 miles in your neighborhood, smoke has reached levels that are unhealthy. Reader-submitted photosTo view photos of the fire from residents, click here. To submit photos, email them to claws@bcimedia.com. 416 Fire Firefighters were battling the 416 Fire north of Durango on Friday afternoon. The fire caused hundreds of residents to evacuate. La Plata County government set up a hotline residents can call to learn more about the evacuation notices and to help coordinate help evacuating livestock. The hotline phone number is 385-8700. Four Corners Back Country Horsemen are ready to help with any horse or livestock evacuations. Trailers and pasture are available throughout the county. For assistance, call (570) 228-1340. For people who received a pre-evacuation notice, these steps can improve their safety and expedite departure should an evacuation become necessary. Inside the houseGather medications.Pack a bag with clothing and essentials.Shut off air conditioning and fans.Shut all windows and doors before leaving.If you have time, gather paperwork and photographs that cannot be replaced.Outside the houseGather flammable items and bring them inside (patio furniture, children’s toys, door mats, trash cans, etc. ).Move propane barbecue appliances away from structures. Connect garden hoses to outside water valves or spigots for use by firefighters. Fill water buckets and place them around the house.Don’t leave sprinklers or water running; this can affect critical water pressureLeave exterior lights on so your home is visible to firefighters in the smoke or darkness of night.Back your car into the driveway with vehicle loaded and all doors and windows closed. Carry your car keys with you.AnimalsLocate your pets and keep them nearby.Prepare livestock for transport and plan to move them to a safe location early.Pack food and medications for your pets.InsuranceTake pictures of the interior of your house to remember and document personal possessions.Determine what is sentimental and can’t be replaced. 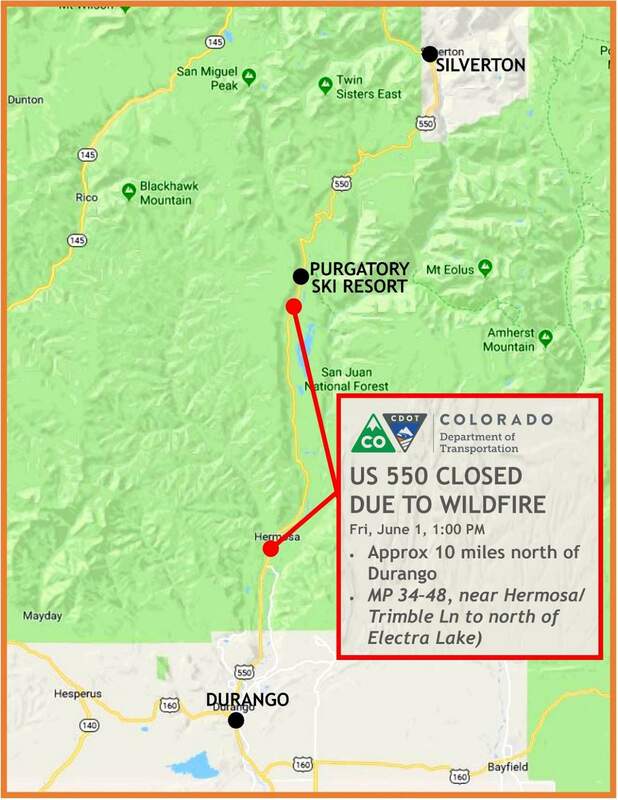 U.S. Highway 550 is closed north of Durango. Here are suggested alternative routes.